Now that Greece has voted “no” again to European Union austerity measures, tourists may be wondering if it’s safe to travel to a country in the middle of a financial crisis. The nation’s banks are limiting ATM withdrawals and concerns are growing that basic goods could become short on supply, but travelers appear unrattled so far. In fact, tourists are eyeing Greece as a potential bargain. In the U.K., the travel site Skyscanner reported a 16 percent increase in online searches for flights to Greece compared to the same period last year, mostly due to the strong British pound. And if Greece pulls out of the Eurozone – a “Grexit, ” so to speak – tourists could get an even bigger bargain if there’s a rate collapse. "We’ve had a few people calling in to check and make sure the tours are still going, but all our trips are running and I don’t envisage something happening at the moment, " said Peter Sommer, who operates a travel company that specializes in tours throughout the Mediterranean. "If you were in Greece right now and you weren’t in the city centers of Athens – or watching the news – then you wouldn't even know there was something going on." He said he’s seen a surge in bookings, particularly from experienced travelers. "If you were in Greece right now and you weren’t in the city centers of Athens – or watching the news – then you wouldn't even know there was something going on." Emily Brauer, an American graduate student who traveled to several islands, including Crete, Myknonos and Santorini, during a recent 11-day tour of the country, said it’s business as usual. “There was a small protest in front of Parliament the day we visited Athens, ” Brauer said but her group had no problems withdrawing cash or using credit cards at the few venues that take them (many places were cash-only). While locals are being limited to withdrawing 60 euros – about $66 – a day, tourists can take out as much money as they want. But some outlets have reported long wait times at ATMs, and some travel experts are advising travelers to bring enough cash to cover all their costs in case of a bank collapse. "If people are not going with an organized group, they should definitely take their own currency and euros. 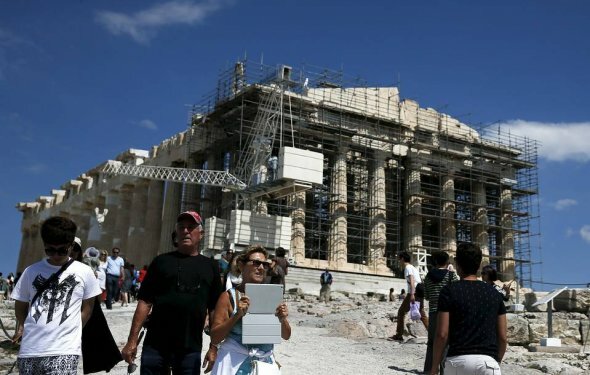 Besides the Acropolis Museum, very few sites takes credit cards anyway, " Sommer said. "So far, there have been no interruptions at the major archeological sites, as most sites are state-controlled, " Sommer said. He said there could be some disruption "if the people [operating tourist sites] stop getting paid, " but he does not foresee that happening soon because tourism is hugely important to the Greek economy. "I've spoken with boutique hoteliers on various islands and they would love people to come. They really end up valuing the tourism even more at times like this, " Sommer said. 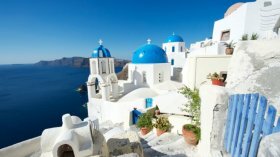 The dependence on tourism has made Greek travel businesses even more hospitable, Brauer told FoxNews.com. Jon Edward Martin is an American author, who writes historical fiction novels. He is best known for his novels about Ancient Greece. He is a native of Massachusetts, who holds a bachelor's degree in English Literature. He is married with three children; a daughter and two sons and he lives in Boston, Massachusetts. Dr. Tsui Shung-yiu, SBS, JP is a former Director of the Hong Kong Marine Department. He was awarded the Silver Bauhinia Star for his service to the Hong Kong Government in promoting the growth of the Hong Kong Shipping Register and helping to maintain Hong Kong's status as a leading hub port and international maritime centre.